'Jughead' #2 proves that the first issue was no fluke. Chip Zdarsky shows he was born to write Jughead by drawing on his classic legacy as a hungry, hungry, Riverdale High student with slacker tendencies in a modern setting. Erica Henderson's colorful energetic designs bring a joyful whimsical atmosphere. Jughead, as it turns out, has a method to his madness and when a new gym teacher throws down the gauntlet he steps up...after a brief nap. The beauty of Archie's rebooted 'Jughead' is that it's not a complete reimagination of the character but just an updated version. The times may have changed, but Jughead remains the lovable burger-fiend who finds the easy way out of situations. 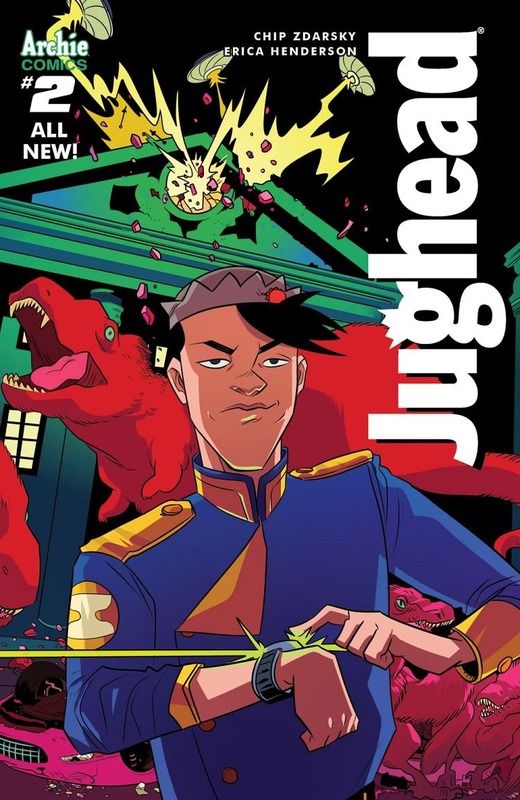 When the new gym teacher is more of a dictator and sets a number of mandates on the kids, Jughead is determined to avoid detention but it takes some brainstorming to find the right way to bend the rules just enough to beat the teacher. While the lighthearted fun and humor is still there, Zdarsky smartly frames Jughead's plan of action with a little help of another dream sequence like he did in the first issue. This may be a silly and funny book, but it's well-orchestrated silliness. The time travel dream is entertaining in its own right, but it also serves as a spark of inspiration for Jughead. It's not just a goofy detour for the sake of a goofy detour. Henderson's work transcends genres within one story. You have the fun and bright nostalgic scene in the ice cream shoppe then the scenes with the coach are darker and more menacing. The art changes gears again in the sci-fi-inspired dream with more creative flourishes involving dinosaurs and Vikings. Coupled with great character designs, expressive faces and dynamic layouts, Henderson was the perfect choice to illustrate this new series. 'Jughead' #2 captures the spirit of the classic character with some smart plotting and joyous artwork. Zdarsky and Henderson build on the excellent first issue with another inventive story that'll bring a smile to your face.